COLUMBIA STREET WATERFRONT – A group of Columbia Street Waterfront residents are rallying to oppose a developer’s plans to build a seven-story building in their low-rise neighborhood. Neighbors Katarina Jerinic and Anthony Bradfield live on Carroll Street, directly behind the proposed development site at 41 Summit Street. The pair have been leading community efforts to fight against the plan, reaching out to their neighbors, compiling nearly 200 signatures in a petition, and attending all of the ULURP hearings to voice their opposition. Bradfield first learned of the proposed development in October, one week before the project was scheduled to go to vote at a Community Board 6 Land Use Committee meeting. The short notice about the meeting did not deter his organizing efforts. Since so many people are against the plan, “It was very easy to motivate people in a very short amount of time,” Bradfield said. Jerinic learned about the proposed project from Bradfield. “We developed that petition and started talking to a lot of people. Anthony did a lot of research about what it meant and what it could mean because the flyer really didn’t have a lot of specific information in it,” she said. Soon, a group of nearly 20 neighbors was formed, rallying together against the plan and meeting with Brooklyn Borough President Eric Adams and Council Member Brad Lander to discuss their concerns. 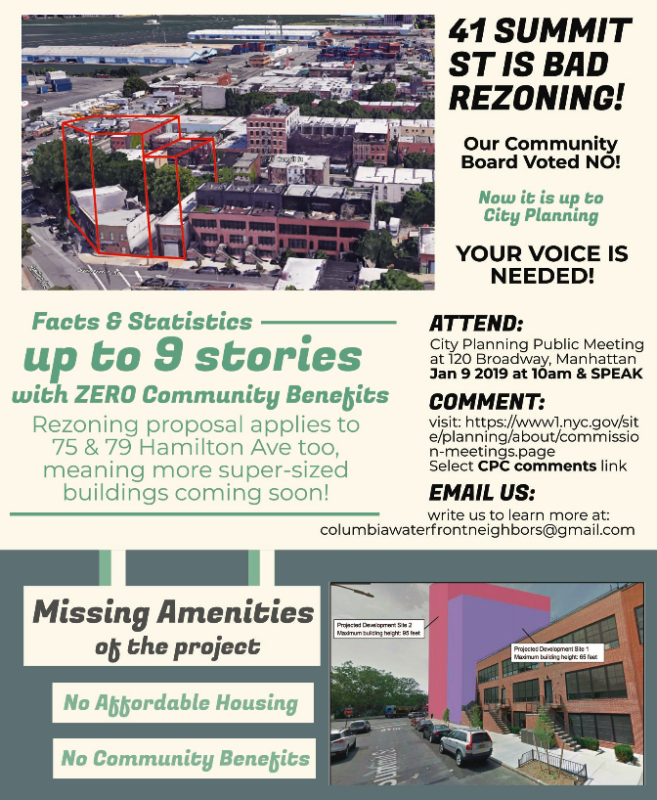 “Essentially [the plan is] to rezone three lots, and the first lot they’re saying ‘it’s a seven story building,’ which is still twice as tall as anything else in our neighborhood…but because they are applying for a R7A [rezoning] they actually have permission to build up to 9 stories,” Jerinic explained. David Rosenberg of Sheldon Lobel, P.C., a law firm specializing in land use and zoning, presented the proposed rezoning plans at the packed Community Board 6 Land Use Committee meeting last October. 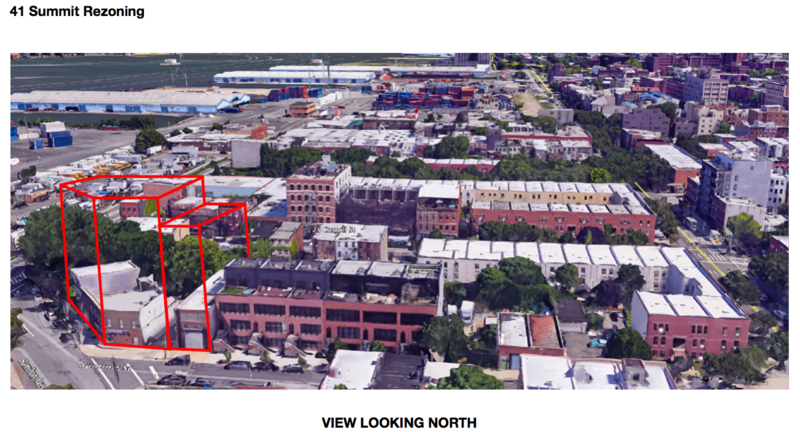 Rosenberg’s client filed a ULURP zoning map amendment application with the NYC Department of City Planning requesting that an area spanning Summit Street and Hamilton Avenue be rezoned to allow for the construction of a new seven story residential building. 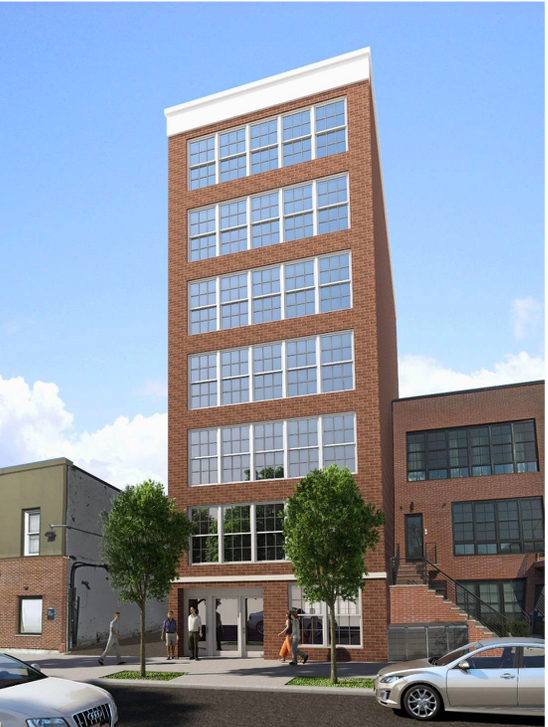 41 Summit Street, which is his client’s property, would feature ground-floor retail and nine market-rate apartments. The request seeks to amend the Zoning Map, changing 41 Summit as well as two adjacent properties, 75 and 79 Hamilton Avenue, from an M1-1 zoning district (light manufacturing) to an R7A (residential) / C2-4 (commercial overlay) district which would allow for the development of a mixed-use structure that could rise as tall as nine stories. Other areas surrounding the site have R6B zoning (medium-density or “often traditional row house districts.”) Rosenberg’s client does not own the two Hamilton Avenue sites. If the request is approved, the three lots could be combined to create a nearly 8,000-square-foot plot with more than 23,000 square feet of residential space—allowing for approximately 34 apartments—and nearly 8,000 square feet of commercial space, according to New York YIMBY. 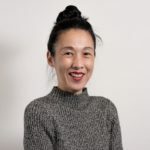 However if the three developers choose to build independently of each other, they will not be required to include affordable housing in their projects per the city’s Mandatory Inclusionary Housing program (MIH) since they would be building less than the MIH-regulated square footage. The MIH program requires that developments with ten units or more or at least 12,500 square feet to set aside a percentage of floor area for permanently affordable housing. Many at the October community board meeting, including Bradfield and Jerinic, argued that the proposed building would be “completely out of scale” and out of context with the neighborhood. They also insisted that a building twice the height of others in the area would block sunlight from neighbors’ homes as well as from the Backyard Community Garden which is located next to 75 Hamilton Avenue (at the corner of Van Brunt Street). The community board agreed with the dissenters and voted to “recommend to City Planning that this ULURP application be rejected” based on the proposal being “out of scale with the adjoining zoning areas” and the developer not taking into account the City Planning study that was done a decade ago when 86 blocks of the Columbia Street Waterfront/Carroll Gardens area were rezoned. Click here to see the Community Board 6 letter addressed to City Planning Commission Chair, Marisa Lago, disapproving the project. Members of Columbia Waterfront Neighbors attended Brooklyn Borough President Adams’ land use hearing in November to oppose the project. Adams released his recommendation on 41 Summit Street on January 14, approving the project with modifications/conditions which include reducing the zoning to R6B—keeping the building height consistent with the neighborhood—calling on the developer to implement resilient and sustainable measures at the site, and promoting job creation through local and MWBE hiring. 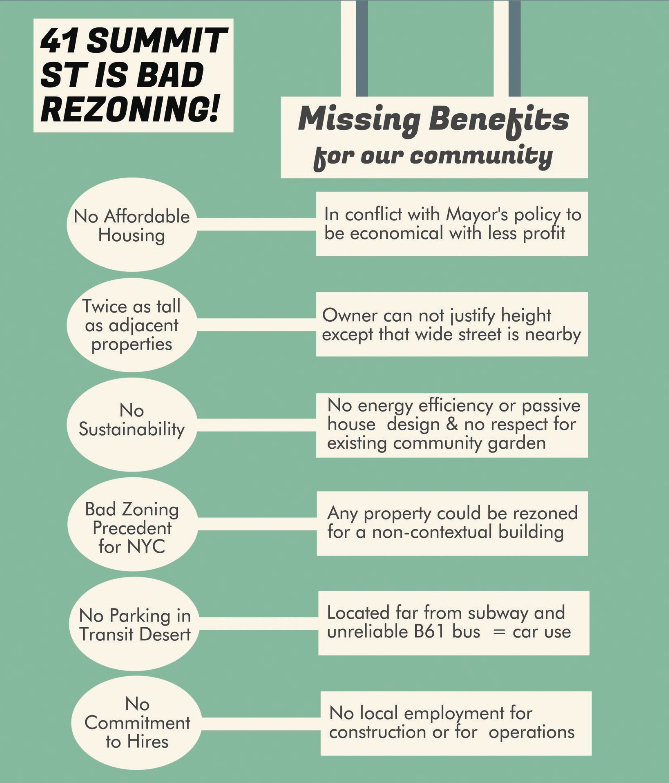 Adams’ recommendation adds that appropriate R7A zoning should consider “adequate transit options,” noting that the area is “not well-served by public transportation, which is a perennial quality of life concern in the community.” His recommendation points out that the closest subway station is Smith-9th Street and that area residents are reliant on the B61 bus. He also expressed concerns about the proposal’s lack of “public benefit,” such as guaranteed affordable housing, and about the “likely shading impacts” on the Backyard Community Garden. “Borough President Adams believes the application before him does not, on its own, merit the requested upzoning to nine stories. Given that the surrounding area contains various lower-density contextual districts, he believes that in lieu of the proposed R7A/MIH residence district, including C2-4 commercial overlay, the existing M1-1 manufacturing district should be rezoned to restrict development to five stories,” the recommendation states. The City Planning Commission’s hearing on 41 Summit Street took place on January 9. The Columbia Waterfront Neighbors created a presentation for the hearing which they also showed to Council Member Lander who met with the group on January 18. Along with neighbor Anu Schwartz, who presented renderings detailing the potential impacts the three buildings will have on the neighborhood, more than a dozen other Columbia Waterfront residents testified against the proposed project at the hearing. City Planning Commissioner Anna Hayes Levin commended the group saying, “I just want to compliment the community for coming out with such a range of thoughtful comments on this process…. I think the range of issues that you’ve identified for us cut across all the kinds of planning concerns that we have to think about and it’s impressive to see a bunch of community planners who do this from learning the ground up, which is the way I came to this kind of work. It’s really great. That’s what this ULURP process is all about.” City Planning Commission Chair, Marisa Lago, agreed with Levin’s praise. “It’s not about the neighborhood changing, it’s about it changing in a way that actually benefits somebody besides the person that stands to make a lot of money selling apartments that nobody can afford,” she added. Next in the ULURP process is the City Planning Commission’s review session scheduled for Monday, February 11 at 1pm in which commissioners will hold a post-hearing discussion on the project. While public comment will not be heard, the meeting is open to the public and will be streamed online. 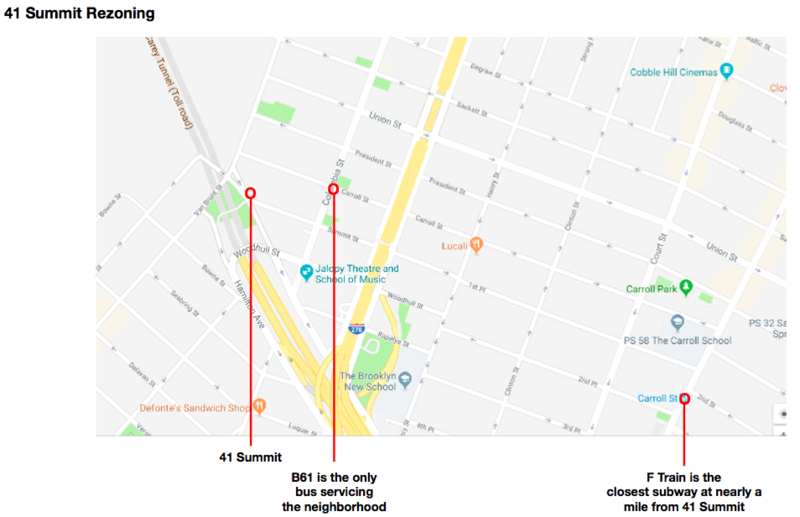 The community can submit comments about 41 Summit Street here. City Planning will vote on the project at a later date. I guess someone can afford the apartments if there is demand for them- this isn’t exactly a billionaires row. It sounds like bitter neighbors who have likely been in the neighborhood a long time and want to resist any change/ natural gentrification and/or deal with large construction projects. The whole block between Columbia and Van Brunt is pretty defunct on all of those streets- developers should absolutely be allowed to come in and it’s the perfect place for some up-zoning. Neighbors are not bitter, they would just like to keep their sun and the gentle feel of no high rise. I know many families in that block and their lives would be uprooted. I live up the block and yes, our open skies feel will be affected. A reasonable alternative is being offered but even then, the owners are trying to wriggle out of the affordable housing option which tells you a lot about their lack of principles.